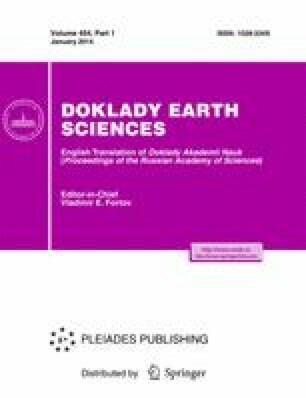 The primary production and fluxes of organic matter to the seabed and their variations were estimated in the Greenland, Barents, Kara, Laptev, East Siberian, and Chukchi seas in 2003–2012 on the basis of satellite and in situ data. When counting the open water area with the assumptions made for the assessment of the primary production in the sea areas hidden under clouds, an increase in primary production was recorded in all these seas, the total production (phytoplankton and ice algae) has grown from 250 × 106 to 400 × 106 t of C per year over the last ten years. The calculation of the OM flux to the seabed showed growth for certain seas from 4 to 12% per year. Original Russian Text © A.A. Vetrov, E.A. Romankevich, 2014, published in Doklady Akademii Nauk, 2014, Vol. 454, No. 1, pp. 97–99.